Bedfordshire Bat Group Reduces Child to tears! Last night we were giving a talk for a beaver group. I used a talk I had used many times before and which has e sween by literally thousands of youngsters. So I was a bit nonplussed when on putting up my second slide ( see below), a youngster in the audience burst into tears. The leaders rushed to her side and it quickly emerged that she was scared of bats. But she soon settled down and the talk continued. I watched her very carefully as I explained about how vampire bats fed on their prey, but she seemed ressured by the fact that they didn’t occur in Britain. After the talk we gave them a chance to meet our captive noctule in small groups in another roomand she shose not to do so. But we noticed that, as Bob was showing the bat to the adult leaders at the end of the session, she was casting sideways glances at it. We asked her ( in a very low key way) if she’d like a look from a distance , and. summoning up every reserve of courage she did so – and eventuallymoved in a bit closer . She watched it for a while and Bob asked her if she thought the bat wasn’t too scary (what we call a loaded question). After a little hesistation she said” no” and gave a little smile. We were really impressed at how she tackled her very genuine fear and so were the leaders who gave her the award of beaver of the week. We really hope that this is one more person who realises bats aren’t terrifying. Once again the Noctule had more than earned her mealworms. At the end of the talk when adults came to collect the children, they were offered a chance to see the bats and it was great to watch the youngsters leading their parents by the hand and telling them about bats. Job done. 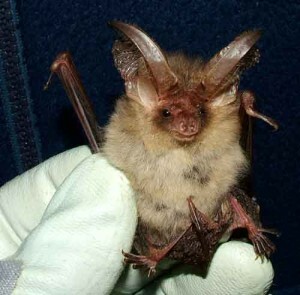 This entry was posted in Uncategorized and tagged beavers, brown long eared bat, talk. Bookmark the permalink.